Rescue Lyris Titanborn from her Coldharbour prison. Lyris must overcome her regrets in order to escape. The Prophet has contacted me across great distance for some important purpose. Go to The Harborage and talk to The Prophet. Help Lyris overcome her regret. Help Lyris overcome her uncertainty. Investigate the Prison of Echoes. Reach the Crucible of Terror. Return to the Harborage and discuss your next moves. Once you are close to a major city, the Prophet appears and tells you to go to the Harborage. Talk to the Prophet in the Harborage. He found Lyris Titanborn, who was enslaved in Coldharbour, working Molag Bal's terrible forge. He says her soul is in great danger, and you need to get her out of Coldharbour right away. 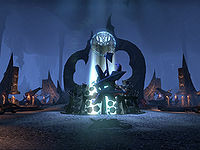 "After Lyris took my place in the Wailing Prison so that we might escape, the Daedra moved her to The Foundry of Woe. It is a place of torment and despair. She toils endlessly, making weapons for the enemy." Enter the portal to Coldharbour. You arrive in the Foundry of Woe, and Lyris is in the right corner. "They've…done something to me. I can't leave!" "My memories, my feelings, they've been fragmented. Ripped apart. And all the fragmented pieces have been locked away in different parts of the Foundry." The Daedra took her willpower, courage, and sense of self. She worries she won't be able to face her worst memories, but you promise to help her. 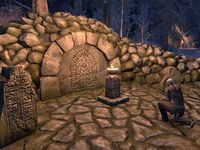 Lyris observes her family's graves. Enter the next room. The bleak landscape of Coldharbour is replaced by snow and stone. "This can't be! It…it looks like my childhood home in Skyrim! My parents graves. My mother died in childbirth. My father was distant. Cold. I think he blamed me for my mother's death. I ran off to become a mercenary when I was sixteen. I never saw my father again. He was murdered by an old enemy." As she kneels and reflects at her family's graves, a spirit named Gjalder appears and runs into the ruins of the house. It is Lyris' father. As you approach the house, Ragjar appears and yells for Lyris' father to die. You have to fight Ragjar in order to speak to the spirit. Talk to Gjalder. The Daedra are forcing him to relive his murder. You tell him that Lyris blames herself for his death, and he talks with his daughter. "My mother died giving me life. It was my fault! I should never have been born!" "Lyris, look at me. The blood of giants flows through my veins. Your mother was a Nord. I gave her my seed without thought for her safety. That's why she died. Not because of you, child. Because of me!" "I thought you blamed me. You…you couldn't ever look at me, Papa!" "Do you not see? When I looked at you, I saw her face. I loved her, child! I love you—more than life itself…You cannot let these feelings haunt you. Let them go. Let me go." Leave the house and go through the door to the east. You enter the Imperial Encampment, her old mercenary camp where she fought with Varen against the Longhouse Emperors. "I tried to be a good soldier, but the rest of the unit…they treated me like a freak. I think they were afraid of me. They liked to hide my armor so I'd fail inspection. Bastards. In a camp full of people, I never felt so alone." You need to find Lyris' stolen armor. Check the three Imperial Footlockers, which look like wooden chests, around the camp. As you search, the soldiers who stole the armor—Gallinius, Medallus and Varo—talk in front of the door. They walk into the camp after they finish talking and attack you. Bring the armor back to Lyris. She puts it on, feeling like she has regained her sense of self. Go through the mines to Clannfear's Roost. A projection of Abnur Tharn appears. Lyris accuses him of betraying the Five Companions, but Tharn says he is trying to help her. To prove his "good intentions" he gives her back her axe. However, Coldharbour doesn't give it up easily—you have to defeat a clannfear before you can take it. Tharn helped her get rid of her blind hatred, although she still doesn't trust him. The way out is blocked by collapsed rocks, but Lyris is strong enough now to break through them. Continue through the Foundry to the Prison of Echoes. There is a projection of Sai Sahan. The Daedra are torturing him, trying to get him to tell them where the Amulet of Kings is. However, the projection fades, and you talk to Lyris again. Use the door lever and continue on. Enter the Crucible of Terror. 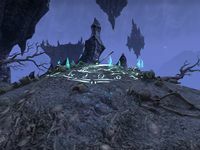 In this area, all of Lyris' fear, doubt, and loneliness returns. The Manifestation of Terror, a watcher, emerges from underground. Defeat it with Lyris to set her free. Enter the portal to the Harborage. Talk to the Prophet after Lyris reunites with him. You can tell him about Sai Sahan and/or Abnur Tharn. The Prophet will search for Sai Sahan, but you should continue to explore and learn new skills. He will contact you again "when the time is right." Prior to the One Tamriel update, this quest could not be started until level 10. On PC, it was possible to get stuck on this quest if Lyris couldn't interact with her Axe ? This was fixed in Patch 1.2.3. The Prophet has summoned me to the Harborage. I should go there at once. I must seek out the Prophet and speak with him. The Prophet has opened a gateway to Oblivion. I must enter the gateway and rescue Lyris, who was trapped while facilitating our escape from Coldharbour. I can see Lyris nearby. I need to speak to her. Lyris is unable to leave Oblivion due to sorcery that has separated her memories and made them manifest. I need to help heal her before we can leave. Lyris has deep regrets about leaving home and never resolving issues with her father. I need to unfetter her from this shackle. I aided Lyris in overcoming her biggest regret. We should continue on. Lyris was always made to feel alone everywhere she went. Oblivion seems to have constructed a mockery of an event in her life, where Imperial troops would mock her and steal her armor. Objective Hint: One of the "Imperials" managed to let slip that they have hidden Lyris's armor. I should see if I can find it. Objective Hint: I found Lyris's armor. I need to give it to her and see if it helps. I recovered Lyris's armor and with it a great deal of her confidence. We should continue on. Lyris has been confronted with a vision of Abnur Tharn on the cliff face. Lyris has reclaimed her axe and wants to speak with me. Lyris has overcome her fears and reclaimed her mighty axe. We need to continue on. Objective Hint: There is a rock wall nearby that Lyris has suggested she can break down. Lyris and I witnessed a projected image of Sai Sahan being tortured. Objective Hint: Lyris is conversing with the vision of Sai Sahan. Objective Hint: I should talk with Lyris and make sure she is all right. Lyris and I saw a vision of Sai Sahan being tortured. We need to get back to the Prophet and tell him what we saw. Lyris's growing terror is being made manifest. We must defeat whatever challenge lies ahead and escape. Lyris has reclaimed her memories. It is time to escape Oblivion through the portal the Prophet has opened. We've returned to the Harborage. Lyris and the Prophet are commiserating. Lyris and I are back in the Harborage. I should speak to the Prophet. Finishes quest Lyris Titanborn is freed from her prison. I must speak to the Prophet. This page was last modified on 5 February 2019, at 00:31.